The summer break is finally over. Ahead of today’s race in Hungary, we take a look back on the last round in Germany. Just hours before the race, Adrian Campfield told the team that he unfortunately would not be able to compete in Germany. Patryk Gerber was drafted in as a last-minute replacement, having little time to practice. Race 1: Once again, the fastest drivers in Qualy were Cenobite Motorsports’ Matthew Williams, STAX Racing’s Chris Shepherd and Chris Butcher (Red Arrow Racing). At the start, Chris lost second place to Butcher. On lap 8, Chris briefly was able to overtake Butcher in the Hairpin, but the Red Arrow Racing driver restored the previous running order when he passed Chris two corners later in Turn 9. Three laps later, Chris again attacked Butcher going into the hairpin, but he wasn’t able to make the move stick after the two drivers took the following corners side-by-side. However, third time was the charm: Chris once again attacked Butcher going into the Hairpin. Again, both drivers entered the following corners abreast, but this time Chris was able to complete the pass and finish the race in P2. Patryk set the 12th fastest time in Qualifying, but an outstanding penalty saw him moved to the back to P28. However, he quickly made his way towards the front. On Lap 10, he overtook Beavis and was now in P15, the first points scoring position. Unfortunately, he outbraked himself into the Hairpin two laps later and fell back to P16. He got back into the points when Mateusz Dabrowski made an error in the last corner on lap 16 and gained another position when he overtook Jones in the second corner. However, both Dabrowski and Jones were able to pass Patryk in the second sector. As he was out of the points again, he made a last-ditch attempt to get back to P15 going into the Motodrome. Unfortunately, this resulted in a spin and he finished the race in P19. Race 2: Chris started the second race of the evening from P12. He gained one spot when Brambilla retired at the end of the first lap. On lap 5, David Jundt uncharacteristically made a mistake, holding up Harry Graham in the process. As a result, Chris was able to pass both of them. Two laps later, moments after Chris passed Miguel de los Rios, Rodger crashed into Browning. Both drivers spun and Chris wasn’t able to avoid them. To add insult to injury, Dabrowski then crashed into the STAX Racing driver. As a result, Chris lost a lot of positions. On Lap 10, he retired from the race after he missed his braking spot and slightly touched Lazaros Filippakos. Patryk started the second race from P19. He had a very clean start to the race and overtook several drivers early on. Later, he also profited from other peoples’ mistakes, gaining multiple positions and climbing up to eight by Lap 7. However, on Lap 13, he went wide in the last corner and dropped back to P11. After Choda spun in the first corner of Lap 15, it looked like Patryk would finish the second race in tenth position. However, the battle for P8 wasn’t finished yet, and with time running out, Graham tried to force a move on Williams entering the Sachs Turn. 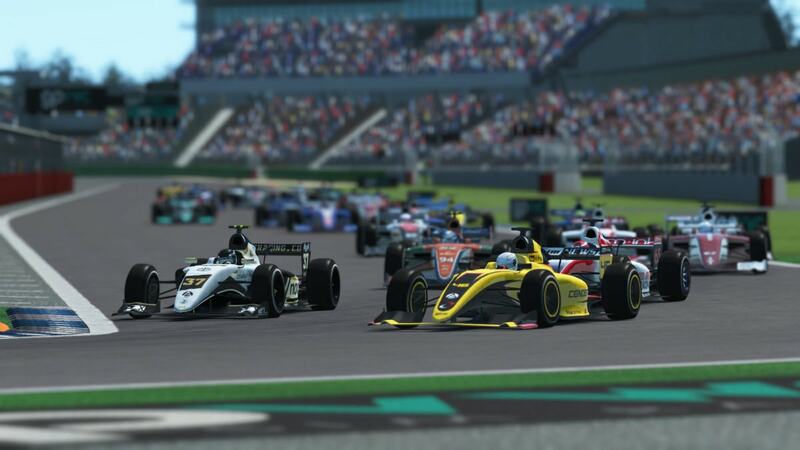 Both drivers spun out and Patryk was able to overtake Williams, finishing ninth. Before the summer break, there was no change in the standings after the German Round. We are still second in the Teams’ Championship behind Red Arrow Racing and ahead of Cenobite Motorsports. Chris Butcher is leading the Drivers’ Championship ahead of Chris Shepherd. Adrian Campfield dropped a position and is eleventh in the standings. The next round of the season will be held in Hungary today. As always, you can find the broadcast and the results tables of the last round below.